The Acer Nitro runs on Windows 10 Home Edition. The laptop features a 15.6,FHD IPS display,1080 x 1920 Pixels and is powered by a Core i7 8th Gen,Turbo up to 4.0GHz processor. To enhance multi-tasking and fast speed, the company has offered a 8 GB RAM. Talking about the storage, the laptop uses a 512GB SSD storage.There is a Bluetooth,Light Weight,Retina Display,Wi-Fi and more.The laptop has a battery that will give enough battery life to the users. The Acer Nitro 5 Spin features a 15.6-inch full HD IPS display, new 8th Generation Intel Core i7 or i5 processors and NVIDIA GeForce GTX 1050 graphics. 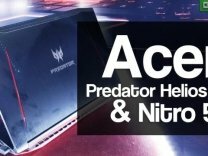 Acer has launched the Acer Nitro 5 Spin gaming laptop for $999(approx. Rs. 65,000) which will ship in October to North America and Europe.